Data from the DUAL V trial investigating the efficacy and safety of Xultophy in type 2 diabetes patients uncontrolled on insulin glargine, were presented at the European Association for the Study of Diabetes Annual Meeting (EASD). The results showed greater improvements in treatment related impact and patient reported physical health in people treated with Xultophy compared to further intensification of glargine. 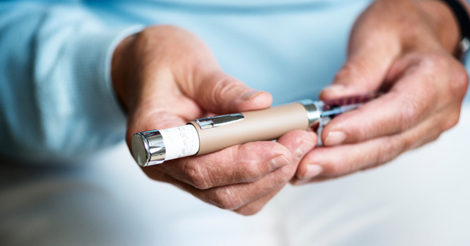 Xultophy is the first ever treatment combining two existing treatments, long acting (basal) insulin (insulin degludec, Tresiba) and GLP- 1 receptor agonist (liraglutide, Victoza) in one pen. New data also presented at the EASD showed that patients with type 2 diabetes receiving the U200 formulation of Tresiba (insulin degludec) experienced significantly lower rates of confirmed hypoglycaemia and significantly reduced mean fasting blood glucose compared to those receiving insulin glargine U1001. Tresiba U200 is twice as concentrated as U100, allowing patients to inject up to 160 units in a single injection, rather than in two separate injections. “These findings provide valuable insights to physicians treating patients with type 2 diabetes, many of whom require higher doses of insulin,” commented Dr Mark Warren, lead study investigator.